Your homepage is not your landing page. If you’re spending money on internet, radio, television or print ads, you need to custom build a specific “landing page” for each of those ads. Landing pages are not websites. They look like a website and will link to your main website, but they are specifically built, tested and tweaked, to match a specific advertising campaign. It’s all about expectations. If someone clicks on an ad for dual-diagnosis treatment, then it’s essential that the page they land on is all about dual-diagnosis. Websites are for people that either found you organically or for your admissions team, to walk a potential client through your website one click at a time. If you don’t have custom landing pages built, for each of your direct marketing messages, you could be losing, 75% of your potential admissions from those methods, or more. If you know what you’re doing creating specific landing pages is essential. For example, if you are advertising for people that need “opiate detox”, you would send them to a custom landing page, that focuses predominately on opiate detox. It will be similar in look and feel to the “Detox” page on your website except, the landing page content, will be more specific, to the exact keywords they searched for. Your Opiate Detox Landing Page will mention all the different forms of opiates including Heroin. 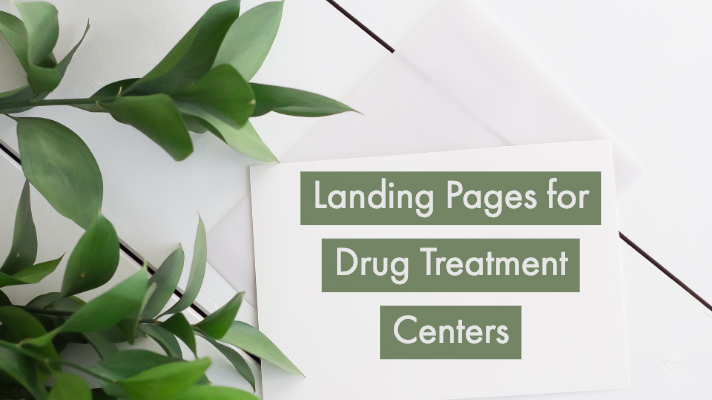 Your landing page will mention using medications in detox, like Buprenorphine, Naloxone, and Vivitrol. What your opiate landing page won’t mention is alcohol. As a side benefit, this really helps with your search engine optimization. You’re creating positive signals to Google. That’s because people are clicking on your page, scrolling and reading the information. All of this behavior is tracked by the algorithm. Most opiate users don’t drink alcohol. They feel unique and different from alcoholics. So if you are advertising “Opiate Detox” why send a person seeking opiate detox, to a page that talks partially about the detoxification process from Alcohol? The result will be a quick hit on the back button. This sends a signal to you are not providing valuable information. It’s worse in reverse. Do you think a person with an alcohol problem wants to be compared to a heroin user? Heck No! If your advertising “Alcohol Treatment” you want to send that searcher to a page all about alcohol treatment. Yes, there will be a carefully placed link to “Other Addictions” for the dully addicted but the page will attract Alcoholic. I am just trying to make a point here why Landing Pages work. Landing pages are much more than just different content. There will be several “CTA” Call to Actions, a lot of Tracking and Tweaking! When a person responds to an ad for say “Opiate Detox” they’re usually in action mode, not research. When a person is in action mode, you need to give them multiple avenues to contact you. This needs to be aggressive but with a subtle touch. You don’t want to look like a neon billboard. This comes across as distrust worthy Landing pages usually have a carefully placed “quick contact” form. A custom chat window, that says “Can I answer your opiate detox questions?” Obviously, a click to call and several well placed phone numbers. Once the landing page is up and running the hard work begins. This is when we roll up our sleeves and start tracking users and reviewing the analytics. We place scroll tracking on all landing pages which tells us where someone exits the landing page. On videos, we place time tracking to see how long each visitor watches and when they exit. Analytics are used to see where visitors came from, and where they go next. We constantly analyze data and make corrections and then start the process all over again. Should I change my headline? Are the call to action buttons easily seen? Remember that your website is your company image. Your landing page addresses a speck problem a person is needing a solution for. A landing page uses whitespace, contrast typography and direction cues to add powerful emphasis to your message. Treatment centers don’t have full-time employees that are skilled in the art of copywriting and presentation. We would love to earn your business. We can create conversion optimized landing pages quickly. Contact us for a no pressure conversation. In the meanwhile, we’ll see you on the interwebs. One more thing. If you would like to see an example of a landing page. This is the one we put together for ourselves. It’s designed to go with ads for our Live Chat Services. Victoria Berman does much of the technical work. She’s efficient because she does this exclusively for Drug Treatment Centers. If you want to learn more, just drop us a note.